Description: Tree branch 4 sided panel. 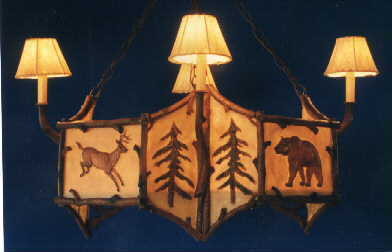 Each side 31"w. With deer, bear, moose (elk or buffalo optional extra) with 8 lights. 4 lights inside for glow. Shades extra. Takes 60 watt bulbs and has drip candle covers. Resin &steel.